Albums on sale at each venue. Cárthach Mac Craith is a sean-nós singer from An Rinn in Co. Phort Láirge and although ‘An Tobar Séimh ‘ is his first solo album Cárthach is no stranger in singing circles. He was the original singer with trad group Danú and is a member of Cór Fear na nDéise. His distinctive singing style is that of his native An Rinn, an area renowned for its singers. Almost all of the fourteen songs on this album are from the Déise area of Port Láirge agus Tiobrad Árann. Cárthach is accompanied on this CD by Seán Ó Fearghail (fiddles), Caoimhín Ó Fearghail (guitar), Eimear Uí Ghealbháin (harp), Méin Nic Craith ((concertina) and Dónal Clancy (guitar). “Éistigí leis an rothán so agus aireoidh sibh oidhre de chuid an tseanrí ag teacht i seilbh a dhúchais féineach agus is bóiceálach an lá do Ghaeltacht na nDéise, don Rinn agus don Ghaelainn é”. Donal McCague (fiddle) and Tommy Fitzharris (flute/concertina) first met at the Ennis Trad Fest in 2012 while having a few tunes with the great Peter Carberry. Donal is a worthy recipient of the TG4 Gradam Ceoil Young Musician of the Year award in 2013, while Tommy has won numerous All-Ireland titles on both concertina and flute. 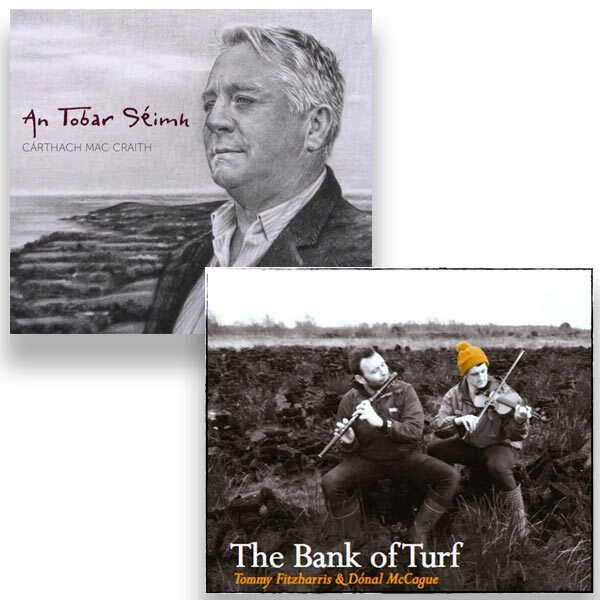 Both are really looking forward to launching “The bank of turf” at this years Ennis Trad fest!